The Prince William Sound Management Area encompasses all coastal waters and inland drainages entering the Gulf of Alaska between Cape Suckling and Cape Fairfield. Prince William Sound (PWS) is a mixture of glacier-hewn fjords, rainforest-blanketed islands, and rugged mountain peaks. PWS’s complex coastline, protected waters, and close proximity to nutrient-rich Gulf of Alaska waters support a broad array of marine life. PWS salmon and herring fisheries, along with other natural resources, such as copper, oil, and gold, were integral in forming the modern economic landscape. Salmon fisheries in PWS have greatly expanded since the mid-1970s, largely due to the addition of hatchery produced salmon. PWS is home to five salmon hatcheries, including the largest pink salmon and second largest chum and sockeye salmon enhancement programs in the state. Salmon fisheries are a major economic driver in PWS, harvesting annually upwards of 74 million fish. Beginning in the early 1900s with razor clams, diverse shellfish fisheries including those for shrimp and scallops as well as king, Dungeness and Tanner crabs, sustained area residents through the 1980s. As shellfish resources declined, fisheries developed for groundfish including Pacific cod, sablefish, and pollock. The Copper River and Bering River districts are located on the Gulf of Alaska east of Prince William Sound. 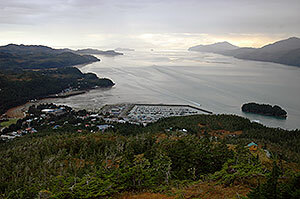 Covering over 1,100 square miles, the Copper River District is the largest district in Prince William Sound. By contrast, Bering River District is approximately one-sixth the size with an open area greater than 200 square miles. The Copper River drains over 27,000 square miles of interior Alaska while the Bering River has a drainage of only a few hundred square miles. Together, these systems provide spawning and rearing habitat for all five species of Pacific salmon. Sockeye, coho and Chinook salmon runs are harvested by about 500 drift gillnet commercial permit holders and managed by the local Alaska Department of Fish and Game office in Cordova. The sockeye and Chinook salmon runs that have been commercially fished since the late 1800s are among the earliest and most prized in the state. Helicopters and fixed-wing aircraft take fish from the first openings in mid-May directly from the fishing grounds to the Cordova airport for immediate delivery to Seattle and other major markets where red carpets, chefs and salmon connoisseurs await.